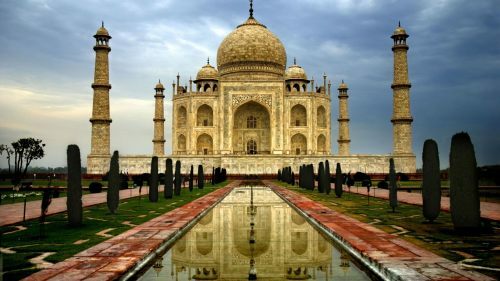 There's an interesting open jaw deal, where you can fly from Seattle to New Delhi, India and then back home to Vancouver for $663 CAD roundtrip including taxes. 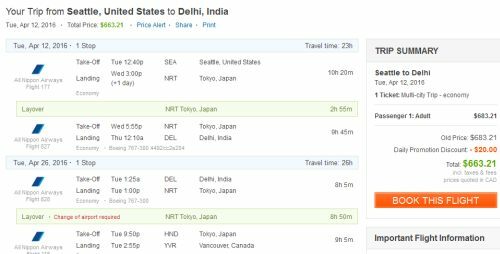 A typical roundtrip flight from Vancouver to New Delhi is around $1000-$1200. The flights are with ANA All Nippon Airways, a very good airline. You would start your trip by taking a one way bus to Seattle. BoltBus is one option. For longer trips, you can try mixing and matching the departure & return dates from the list above. vancouver, yvr, flight deals, asia, india, south asia, del, ana all nippon airways and new delhi. 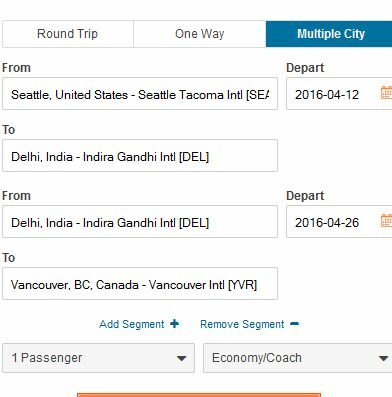 5 Responses to "Seattle to New Delhi, India to Vancouver - $663 CAD roundtrip including taxes"
the deal seems to have ended at midnight PST- Got our parents booked but couldn't get ourselves booked in time. Booked the deal yesterday. They emailed me today cancelling my reservation. @Michael : Why did they cancel ? Was this deal an Airlines mistake ? No, it doesn't work. Tried several combination but still couldn't find this deal! Not surprising, this deal was posted 10 days ago. You may want to sign up for the e-mail alerts to be notified when the deals are posted.